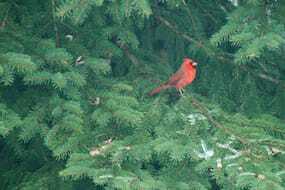 Shortly after we moved into our present house back in September 2012 , I spotted a couple red cardinals that live in the trees in our backyard. And ever since then, I’ve been trying to take a photo of them – they’re gorgeous! But by the time I get my camera out, they’re gone. Or when I’ve been quick enough to get the camera ready in time, as soon as I open the back door, they fly away. And whenever our dogs are in the backyard, not surprisingly, they’re nowhere to be found. I hope to see this little guy again soon so I can get some better shots before we move away in April! 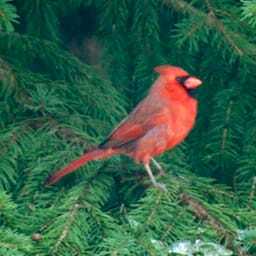 Red Cardinal was published on Friday, February 7, 2014 at 9:55am EST by Daniel Menjívar and last updated on April 11, 2018 at 9:30pm UTC .